The high-performance data center is built around IBM j-type e-series Ethernet switches, m-series routers, and s-series firewalls. This new family of powerful products helps to shape the next generation of dynamic infrastructure. IBM j-type e-series Ethernet switches meet escalating demands while controlling costs. 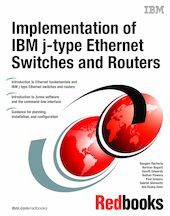 IBM j-type m-series Ethernet routers are high-performance routers with powerful switching and security capabilities.